Advanced DoE with PCA was used to establish a catalytic process in place of a high temperature transformation for a Newman-Kwart reaction. The original process required very high temperatures (>200 °C) which were difficult to reach in standard larger scale equipment and could lead to stability issues for the reactants and products. It was postulated that the starting material, which was reminiscent of a typical ligand, could coordinate to a metal and therefore could be amenable to catalysis. An analysis was carried out to determine the factors which may affect this reaction before an experimental design was planned to maximise the output while minimising the work required. Objective: To identify a catalytic system as an alternative to high reaction temperatures. A catalytic process was unprecedented for this chemistry and therefore a comprehensive screen of potential catalysts and ligands was desired. With no prior knowledge to limit the possibilities there was a huge number of metal, ligand and solvent combinations which could potentially effect a reaction. Combining DoE and PCA was the only logical method with which to efficiently screen the reaction for the best conditions. To screen 4 metals with up to 500 ligands and 100 solvents, over 200,000 experiments would be required if the experiments were conducted one variable at a time! Even if the time for the experiments could be reduced by using high-throughput screening technology, the length of time required for analysis of the results would likely deter the study. Instead, a full factorial design investigating 4 catalysts, 9 ligands and 5 solvents was constructed to fully investigate the reaction space in 132 experiments. The ligands and solvents were chosen from their respective Principal Component Analysis (PCA) maps. Both maps have three principal components to explain more than 70% of the variance of the dataset and separate designs were created for each ligand and solvent selection. Both Rh and Pd catalysts achieved 100% conversion, with every ligand working in combination with Pd when toluene was the solvent. 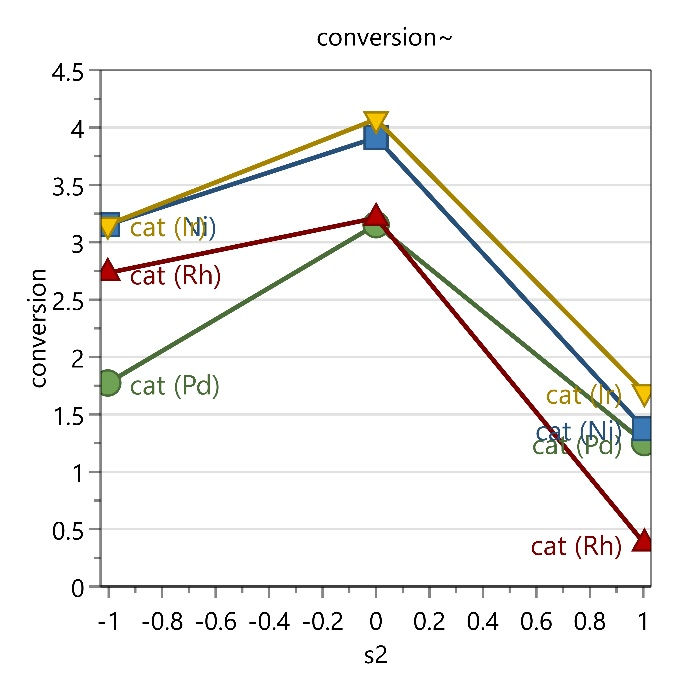 Analysis of the data showed that the ligands with Pd had no significance on conversion but the solvents played a big role, as seen by the interaction plots below, with less polar solvents achieving greater conversion. This was a completely new reaction pathway and a full understanding of the factors and interactions was sought, therefore a full factorial design was carried out. The first reaction to reach 100% conversion was run very early in the design and these conditions could have been used without any further work. Due to the tolerance of Pd with all investigated ligands, this metal was taken forward for investigation with a wider range of substrates. An alternative option, which would give information about which factors were important and some crude information about interactions, would be to perform a fractional factorial design. If the metals were categorised, e.g. Rh & Pd and Ni & Ir, 2 designs each with 19 experiments would have provided enough data to determine which metal, ligand and solvent combinations worked best. 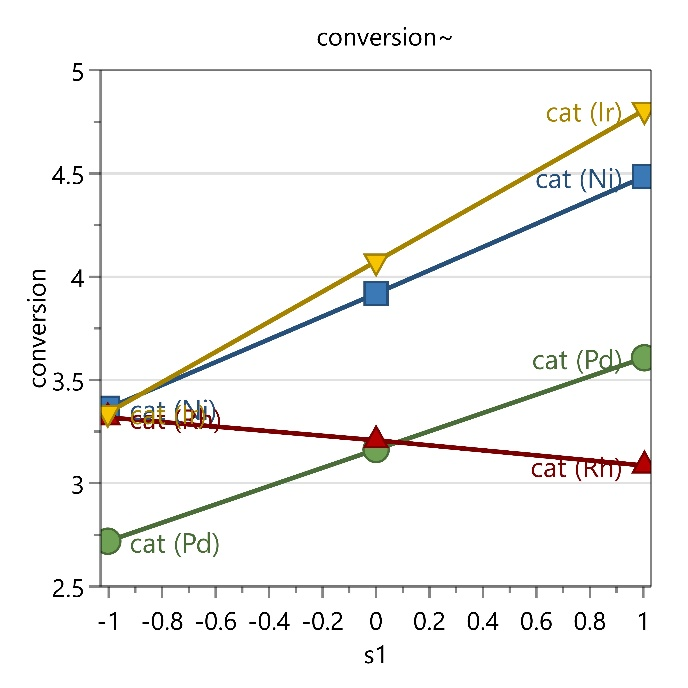 Resolution IV fractional factorial designs result in confounding of the interactions but chemical understanding can often be used to determine which confounded interaction is significant. We would usually use fractional factorial designs to gather as much information as efficiently as possible. Most of our other case studies use this methodology of gaining the most information in as few experiments as possible. Experimental design was used to screen an unprecedented pathway for a reaction. The important factors were identified by careful analysis and then considered in the investigation. This method of experimentation reduced the potential number of experiments from >200,000 to 132. This number can be reduced further still by the use of fractional factorial designs; a very powerful tool for reaction screening. Paul Murray Catalysis Consulting provides Consulting and Training in Design of Experiments (DoE), Principal Component Analysis (PCA), homogeneous, heterogeneous and bio catalysis.